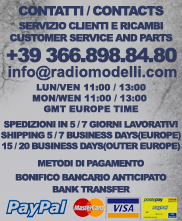 Ready-To-Race® System We Have Ever Offered! 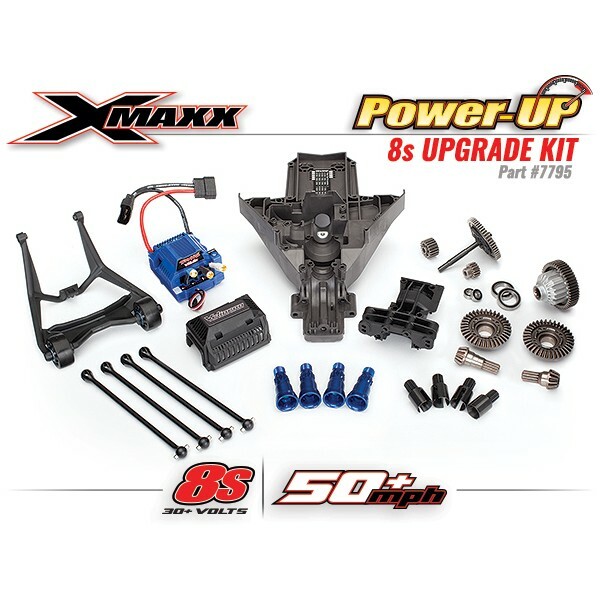 Calling all X-Maxx owners! 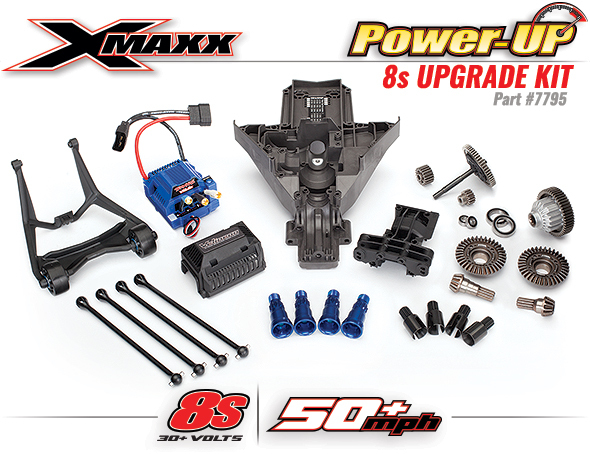 Traxxas is taking the award-winning truck you love to a whole new level of speed and performance with the X-Maxx 8s Power-Up®. 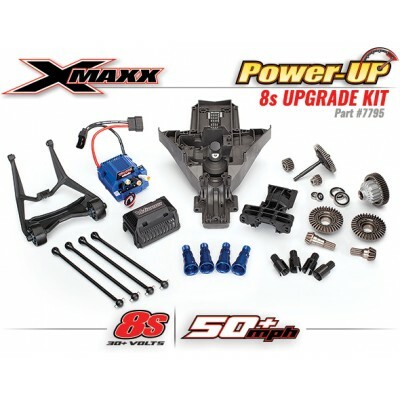 Traxxas engineers tossed conventional thinking out the window to bring loyal X-Maxx owners the most powerful Traxxas system ever developed for a Ready-To-Race® vehicle. 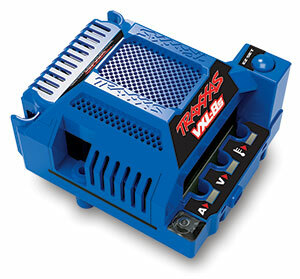 The Power-Up kit starts with the innovative Traxxas Velineon VXL-8s electronic speed control that combines the power of two 4s (4-cell) LiPo batteries for over 30 volts of mind-bending power. The new VXL-8s speed control is an all-new Traxxas design that incorporates advanced microprocessor control with sophisticated software for smooth responsive performance and a rich feature set. The multi-layer circuit board has been optimized for uncompromised high-current power delivery and massive punch. New built-in protection circuitry lets you pour on the power with carefree abandon. Distinct LEDs on-board the ESC keep you directly informed on voltage, current, and temperature, without having to decode tedious blinking patterns. The new built-in power panel includes a high-current BEC output and a fuse-protected battery direct power bus for future accessories. As new features and capabilities are added, exclusive over-the-air speed control updates are a snap with the Traxxas Link app. Of course, it is fully waterproof so you never have to hold back when the fun that lies ahead gets a little wet. We’ve engineered the VXL-8s to be our most powerful, dependable, and easiest to use power system ever. Features aside, the massive acceleration and seemingly bottomless flow of power breathes new life into the X-Maxx like a massive shot of pure adrenaline. It’s no secret that X-Maxx loves to play full throttle in the toughest environments and now we are adding even more power. This is punishing for sure on the driveline, so Traxxas engineers went back to work to make sure that X-Maxx was more than ready for the job ahead. 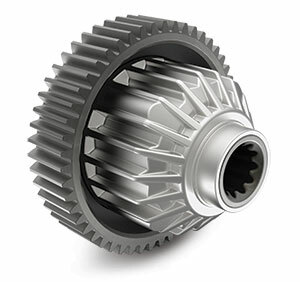 New high-strength precision steel gears replace the originals throughout the complete drive system. All-new ring and pinions use a larger module and special alloys to be the toughest set we have ever produced. The massive torque on tap can overpower even the best slipper clutch, so a new impact-absorbing Cush Drive™ takes its place. 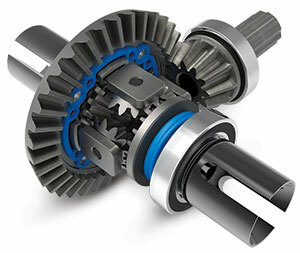 Upgraded driveshafts are specified to handle the twisting torque out to the wheels. Larger main bearings improve durability. No matter what kind of fun you like to have behind the wheel, X-Maxx is ready to take it on. 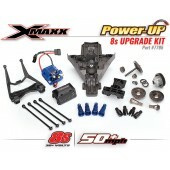 A completely new feature that is part of the X-Maxx Power-Up is the Torque Biasing Center Drive unit. This heavy duty cast alloy drive unit improves front/rear power distribution for absolutely mind-boggling four-wheel drive acceleration. 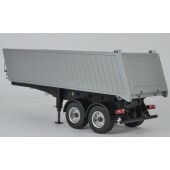 It’s tuned to allow instant, wheels-up punch off the line and seamless, virtually invisible operation at speed. A Powered-Up X-Maxx scorches over and through jagged rough terrain like nothing else. Don’t hold back! Bury the throttle and go big! 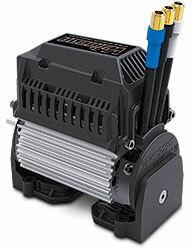 Additional Power-Up elements include a dual-fan assembly to help cool the motor. The new rear bulkhead is beefed up to support the larger main bearings. Heavy duty stub axles complete the driveshaft assembly. And don’t forget the wheelie bar. You WILL need it, often! Installation Hardware (not pictured). Power-Up ships with Blue-Anodized Stub Axles.